You may have heard the term triphasic chart or triphasic pattern and wondered what this meant. 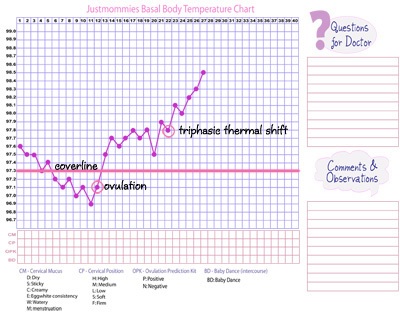 A typical ovulatory bbt chart is considered a biphasic chart – meaning two phases. A triphasic chart means that it has three phases or three sustained temperature shifts. The third shift usually takes place sometime around 7 to 10 days after ovulation and may correspond with the timing of implantation. The reason that women see a shift in their body temperature after ovulation is due to an increase in progesterone secreted from the corpus luteum. Once implantation occurs progesterone levels may increase again. In some cases, this can be seen on a bbt chart. If you can see two sustained thermal shifts on your chart you may have a triphasic chart. However, some charts that are triphasic are not quite as easy to spot. One example of a triphasic chart is one that has a slow and steady climb followed by a second steady climb. But, it is also common to see a chart that has a sustained thermal shift after ovulation, followed by a slight or even dramatic dip in temperatures around 7 to 10 days after ovulation, and then followed again by an even bigger increase in temperatures. Does a triphasic chart mean you are pregnant? The short answer no. A triphasic pattern on your chart could be an early indication of pregnancy. However, having a triphasic pattern doesn’t necessarily mean that you are pregnant. If you do have a triphasic pattern on your chart though consider it is a good sign because it is more frequently seen on pregnancy charts than non pregnancy charts.